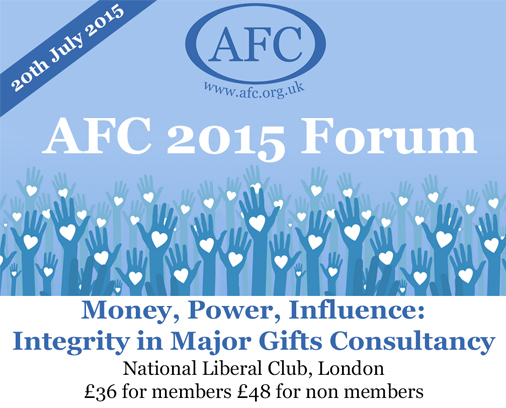 This and other scenarios will come under discussion at the AFC¹s Annual 2015 Forum – Money, power, influence – integrity in major gifts consultancy. Monday, 20 July 2015 from 15:00 to 18:00 (BST) followed by networking drinks and optional supper. 5 – 5.30 pm Challenges in major gifts consultancy. Group discussion of challenging scenarios that arise and ways of addressing these. 5.30 – 6.00 pm Plenary Groups feedback the results of their discussions.